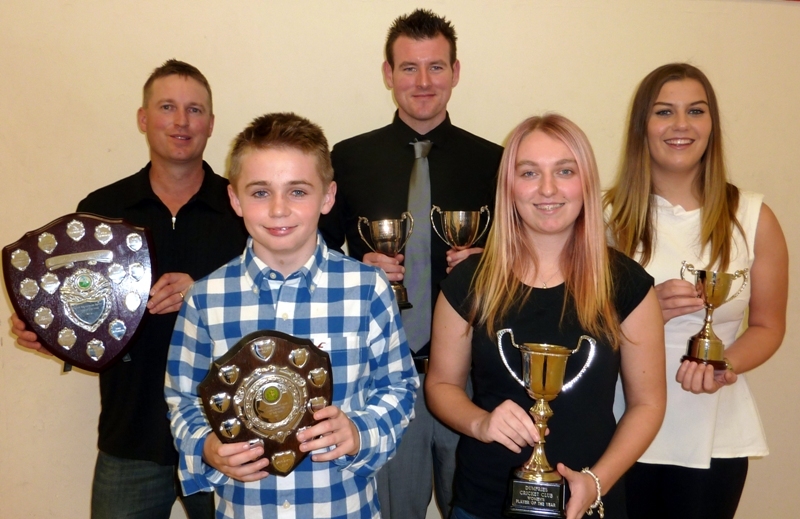 Alan Davidson was the player that picked up the trophies at the Dumfries Cricket Club 2013 Awards on Saturday evening. He won the McKerrow Trophy as 1st XI Player the Year for his performances in the League and Cup as APD Dumfries finished third in the CSL Western Premiership. He was the Club’s top wicket taker with 28 wickets, as well as the League’s second top wicket taker with 24, and completed an all-round effort as the Club’s third top run scorer with 338 runs for the side. The season highlight was his remarkable spell of swing bowling to take 7 wickets for just 9 runs at Nunholm for a win against West of Scotland in the second last game which ensured that third spot. That also meant he picked up the Jimmy Steele Bowling Award. An Award he was already in line for having taken six wickets in a match a couple of weeks earlier. To complete his set of trophies his fellow team-mates weekly votes gave him the 2013 Players’ Player of the Year Award as well. Spinner Jerry Goodin won the Freddy MacLachlan 2nd XI Player of the Year. He was by a distance the top wicket taker with 26 wickets as well as contributing valuable runs with the bat to help Eco-Genics Nunholm finish fourth in the Western Premier Reserve League. The Young Player of the Year was fourteen year old Chris McBride as he consolidated his place up the order for the 2nd XI contributing over two hundred runs with his mature performances with the bat. The Dumfries Women’s side finished third equal in their first season in the Scottish League and their Player of the Year went to Kirsty Strachan as top wicket taker and top scorer with one match-winning innings of seventy not out and for earning her first Scotland Cap. Particularly for the development in her bowling, the Strachan Cup for the Most Improved Player was awarded to Ryan Ryan. The Dumfries Cricket Club AGM will take place at Dumfries Sports Club, Nunholm, on Friday the 22th Nov at 7pm.